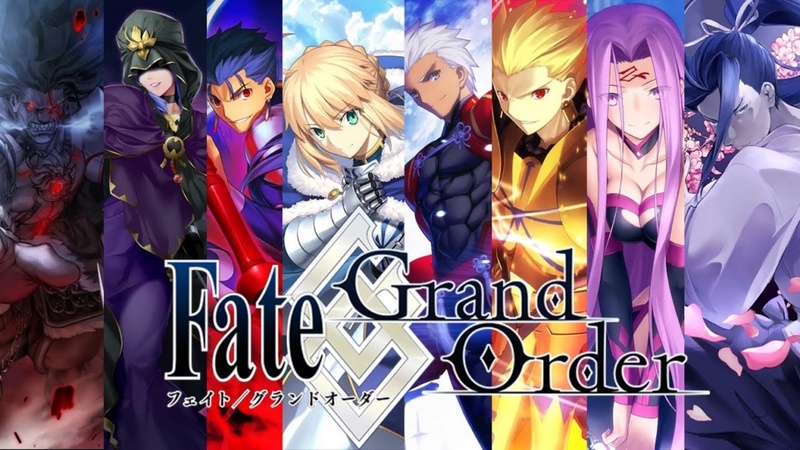 Fate Grand Order is a free to play mobile game that can be played on Smartphones, tablets, and possibly pc/mac. It takes up around 1- 2 gigs (Gigabytes) if you going mobile device. Before starting the review here are some pointers of understanding this game and the Fate series as a whole. Servant- They are heroic spirits used for fighting in the holy grail war and is normally summoned by a master. Heroic spirits come from legends, folklore, urban legends, characters who play important roles in history and so on. Command Spells - Command spells work as a way to force a servant to completely obey their master command no matter what it is. This can be used to unleash their Noble Phantasm against their will, commit suicide, do an action they would normally never commit, stand down from attacking a person and so on. Think of it as an ultimate obedience command. Holy Grail War- Seven masters and seven servants of different classes are forced to participate in this type of war. These wars are highly dangerous and there can only be master and servant surviving at the end in order to win the war. The prize is the Holy Grail which grants the winner any wish they want no matter if it's impossible or inconceivable. It will come true. 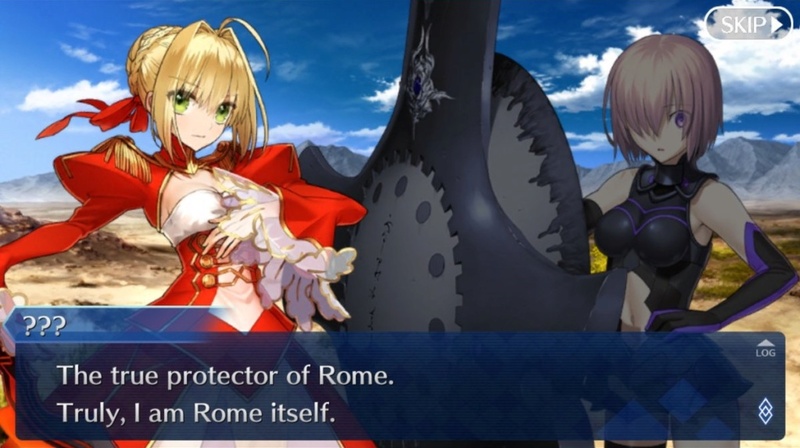 Fate/series Genderswapped- In this series including their games, novels, and movies many of the historical characters that come as servants are that was supposed to be a male is now a female. This happens very often in this series. Prime examples are King Arthur, Nero Caesar, Attila the Hun, Jack the Ripper, Frankenstein and so many others. Just keep this in mind when dealing with the Fate/ series. Counter Guardian Force - A very special type of servant who works is to clean up the mess if a servant goes out of control and tries to rule or conquer the world. One of these powerful beings show ups and take care of the situation. Yes, they are extremely powerful! The player starts off picking their name, gender, and age. Then quickly escorted to a base in the way out in the artic area hidden from civilization. This base is called the Chaldea here the player is registered as a master. Here the player meets the main cast a squirrel like dog named Fou, a purple hair girl named Mash who refers to calling you Senpai (Master), Dr.Roman a lazy doctor with a fluffy orange ponytail, Lev a cool guy with a green outfit and a spoiled rude rich girl who's your boss. The main goal is to get all the masters gathered in Chaldea to stop the rapidly approaching threat, mankind is going to become extinct by the end of the year 2018. By way of destroying history in the past by causing extremely anomalies to happen which leads to the destruction of the near future. Masters are tasked with going back in time with their servants to stop the anomalies to fix the future. There is only one problem. All the 98 masters attending have all been killed in a terrorist attack. The only survivors are the Mash, Fou, Dr. Roman, The player and the spoiled rich girl. By having Dr.Roman send everyone into the 2004 Holy Grail war in Fuyuki Japan. Meeting the heroine of the Fate/Extra franchise and dealing with her singularity issues. This is how the story progressing takes place in Fate Grand Order. In order to progress in the story and stop making from going extinct the player must travel into these story arcs called Singularities. There are a total of seven singularities each one has their timeline, cast of colorful characters background and 100% absolute craziness including plot twist included in them. There is no such thing as starting one singularity and heading to another one, you have to complete the first one in order to unlock the next singularity. There are also side quests/ events that the player can participate in. They have no involvement with the main story what so ever but they do offer up good prizes and a chance to earn Craft Essences (Equipment for servants) servants or materials which is highly recommended. Story wise. The Fate series always had a phenomal of storytelling. These guys are hands down amazing at it including the translation team. There have been many times where I have been completely surprised by the plot twists and who shows up to save the day. Or even the events which is rememerable and highly favorable among the community of fate players. This is easily a great game if one is intrested in storytelling. You can not go wrong with this title. This is how the player will gain a majority of their servants and craft essences outside events and story completition rewards. This game has features a Gacha system (Smiliar to a capsule toy machine, loot boxes, lotto system) which comes in the form of banners. There are typically three banners running at all times and on special occassions, four or more show up. 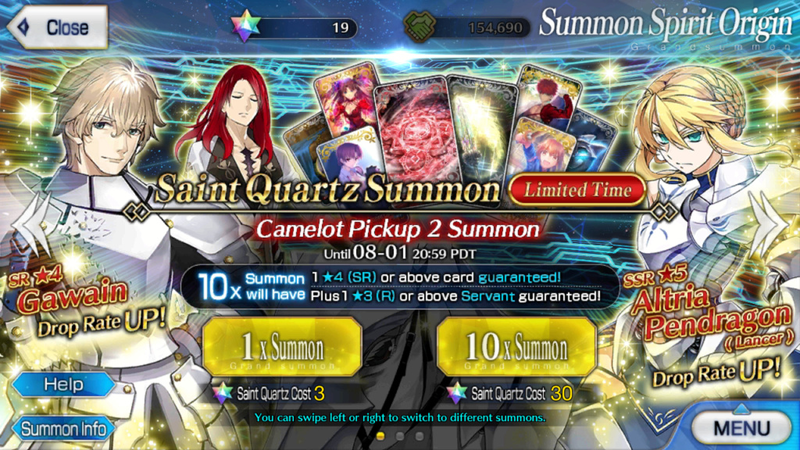 There are basically two choices to the summoning banners a single roll or a ten roll. In order to do a roll, you must have saint quartzs, and/or summoning tickets. 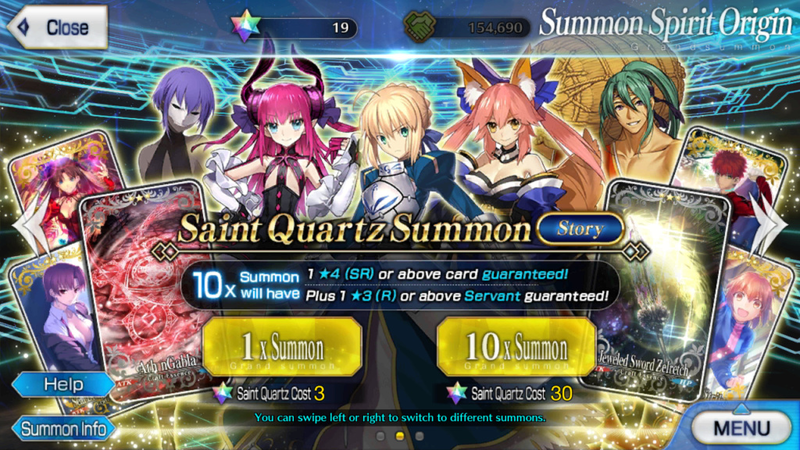 Summoning tickets and be earned and purchased from the mana prisms shop. Saint Quartzs can be purchased with real cash or obtained from various of different methods in game. With a single roll you just use either three saint quartzs or just 1 summon ticket and that's it. However for a 10 shot roll that's 30 saint quartzs and you are guarnteed a four star or higher craft Essence or servant upon rolling. 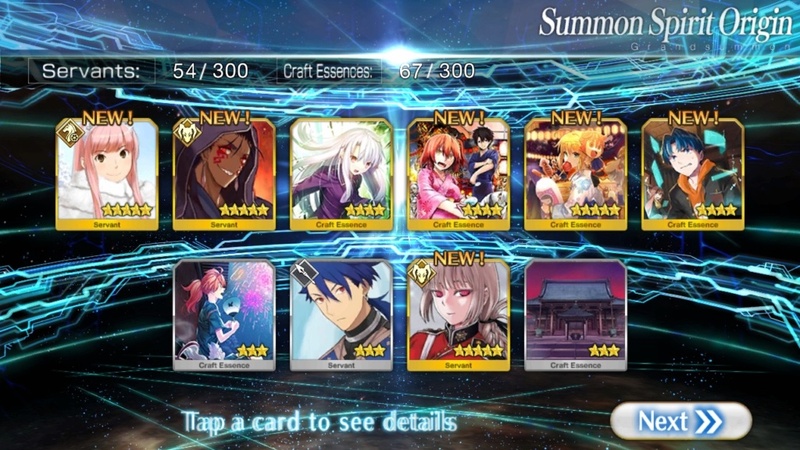 This is a 10 shot roll from a Friend Point banner. 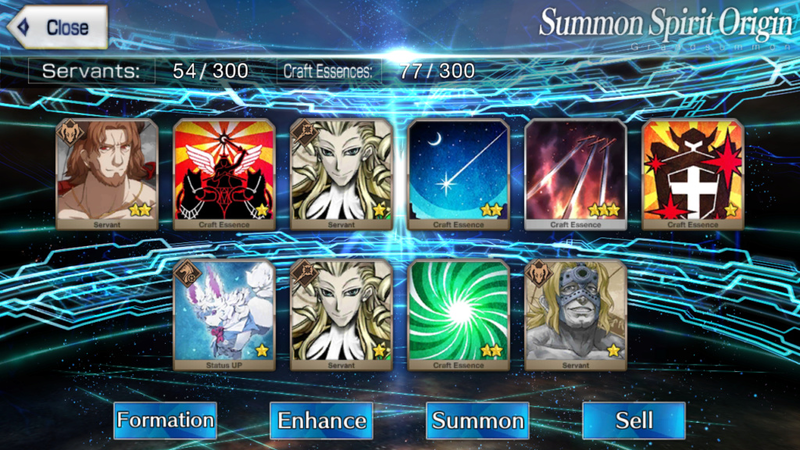 And this is a 10 shot roll on a limited banner. 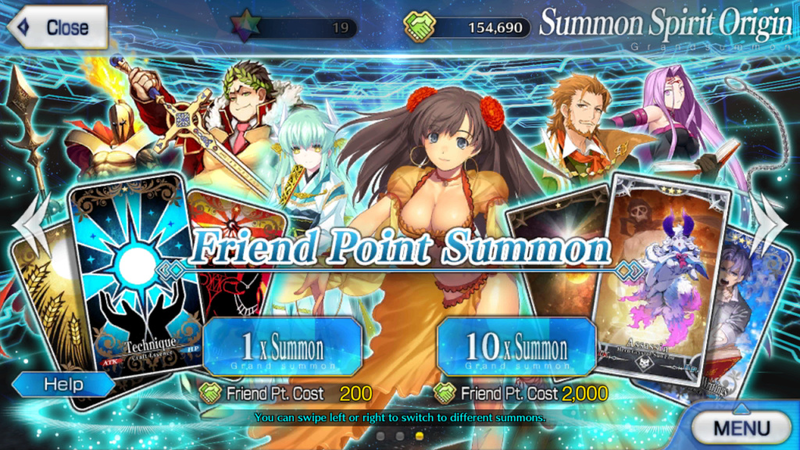 Friend Point banner is a very friendly banner that gives you a free 10 roll every day which consists of exp cards, fou cards which power up servants base stats, rank one to three star servants and that one very special rank zero servant (A one in a million chance to get him). If one wishes to roll more on this banner they can by using friend points they accimlated from friends or battling. This is tied in with the story. The further you are in with the story the more craft essences and servants are unlocked. To be honest no one really uses this banner and it's not recommended to it's a huge wild shot to gain anything you actually want from here. These are the banners many Fate Grand Order players will use their resources on. When it comes to events they have craft essences to make the event go by easier and make farming for items to progress or spend in the special event shop a whole lot quicker. Then there are some servants are only obtainable during these limited banners or events. Many of them are just amazing at what they can do and make a massive difference in your gameplay. However, they are quite rare. But if you don't get them don't worry many event/ limited servants make a return at a later date or perhaps next year. When on the topic about craft essences and servants this can go for a very long discussion. So in order to keep thing simple here is the short version of what you need to know. Servants in this game comes in different ranks and classes. The higher their rank the better their stats and max level cap are and of course harder to obtain. one stars have a max cap of level 60, two stars have a level cap of 65, three stars level cap is 70, four stars is 80 and finally, a five star level cap is 90. When it comes to their classes they have a class advantage triangle in this system similar to those who played Fire Emblem titles or games with features such as that. The class advantage is the class deals more damage to X class and takes less damage from that class. The first triangle consists of sabers, archers and lancers. Sabers beats lancers, lancers beat archers and finally archers beats sabers. The second triangle is Riders, Magicians, and Assassins. Assassins beats Riders, Riders beats Magicians, and Magicians beats Assassins. This is the simple rule of the game so far. Next, we have bersekers and extra classes. Beserkers are your glass cannon servants they go in deal massive damage and die fast. They deal double damage and recieve double from all servants except from those in the extra class category. Shielders have no advantage against anyone attacking but has a crazy amount of defense. Mash is the only Shielder servant thus far. There are many other extra classes and it just gets crazy when discussing them, they are very powerful. In this game, you battle using your servants. The master only provides support using spells he/she has equipped by via mystic codes or using command spells. 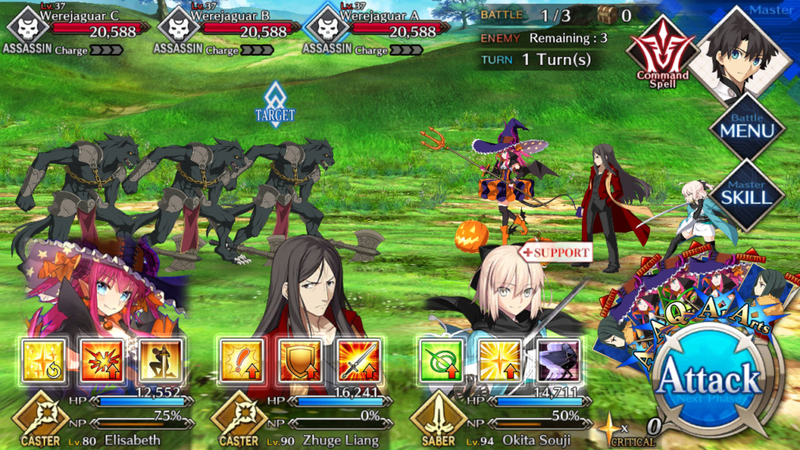 As the battle starts you are randomly given five command cards of the servants out on the field which comes in three attacks Buster, Arts and Quick. Buster is a strong attack, Arts is a medium attack but charges the np gauge faster than any other attack, Quick is the weakest attack but generates more quick stars which is asborbed by your servants to increase their chances of a critical hit for big damage. Servants have a total of three skills. Which ranges from increasing their combat peformance, weakening the enemy, healing, charming and so on. A teenage idol in a halloween costume, a chinese stragetist, and small girl samuari girl with a severe lung disease vs werewolves, a chimera and bruce lee who would win? If any of the front line servants are defeated the ones in the backline will immediately step in and continue the fight. Once all enemies are defeated you are awarded with Bond experience for the servants (Used to learn more about them and obtain more skills) Master exp and mystic code exp. Once the player obtained enough master experience they will go up a level which is highly benefical. When a Master levels up it refills and increases how much AP you can have which is used for going on missions, the party cost increases so you can have equip more powerful servants and craft essences. Mystic codes take an absurd amount of experience just to level up once. They have a level cap of 10 but when a mystic code levels up all the spells effectiveness goes up. Along with those items she has you need experience cards too. The is really no complaint when it comes to graphics. The battle sprites are amazing and coloful and some animations are over the top amazing. Outside of battle, it's more of a visual novel experience many of the characters are expressed well during their dialogue. And many of the best artworks are the final ascension stages of a servant and craft essences. The short answer is the artwork is flawless. As of right now the soundtrack of Fate Grand Order is very limited. Their song does fit the theme of what's happening in the game but more variety would be apperiacted. The Fate Grand Order community is abosuletly wonderful. The people who play this game are incredibly helpful weither they play on Global, Japan or Korean servers everyone love discussing about servants battle strageties who work well with who and so on. The worst things you see in these communities is between a sarcastic remark and a person ranting because they didn't get the servant they wanted. 1. Is this game pay to win? My Response: No it's not you don't have to spend a single dime in this game and still have fun and get through all the content. There are many players who are free to play and do fairly well. 2. Is X servant good? My Repsonse: As long as you didn't get these servants you are okay. Saber Gilles, Rider Astolfo, Magican Gilles de Reis and Lancer Fionn Mac Cumhailli. Those servants are just very lackluster and bad. 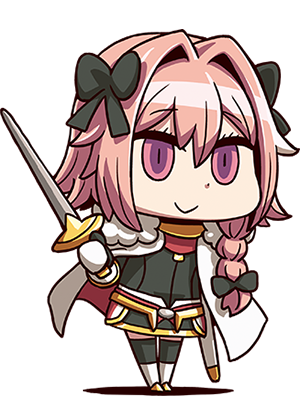 This is Astolfo, if you have this servant as your rider. This servant is not great in battle. 3. Which banners should I roll on? My Response: Roll on every banner till you get a character that fills your class role. Example if you don't have a saber or a good one wait for a banner that have sabers and use your resources to roll and have a chance of getting who you need. My Response: 1% . Yes, it's that low your best bet is to roll on banners what you need. I've seen tons of players get their hopes up and never get who they want. Just have fun. 5. What servants that are not four star or five stars that are great? My Reponse: There are many but here are a few that stand out Archer Robin hood, Lancer Cu Chullian (Mature version), Magicans Medea, Shakesphere, Hans Christian, Saber Julius Ceaser, Berseker Lu Bu, Rider Ushiwmakamaru. 6. Is this a good time to start playing? My Reponse: Yes. You can catch up to the rest of the players within a few weeks of story content in fact we are getting very powerful free four star servants that can be a massive boon. Don't worry about what you missed, the game has reruns of events. This game is simply amazing, amazing story, great graphics, a huge wonderful cast of characters. It's a very popular mobile game all over the world. I personally love the game many of the events were just funny and a blast to play. The only problem that the game currently has is the low drop rate for rare servants and the music. But we are getting updates of more music content coming out real soon. If you need a fun mobile game to pick up and play this is an easy gold contender. Good review. Emiya for life! @Nintendobuddy64 Thanks! I'm glad you liked the review. Funny you mention Emiya, he just recently got buffed. Also his female counterpart Kuro I believe her name is will be in the game for free around late summer. Great work dude and thanks for the review! @Reanfan Shucks, WiiWareWave was the last review site of the one's I frequent that didn't have those stupid Taboola advertisements below the articles. I'm sure you had nothing to do with it getting added, but still it was nice while it lasted. @Kain Yeah unfortunately our forum host is getting a bit desperate to stay in business so it's understandable, but still I'm sorry for all of those ads. Great review mate, this game is insanely good compared to other mobile games on the market. Thank you all for reading and enjoying the review. @Grumblevolcano Yeah it is! It's really amazing for a free to play game. Easily one of my top favorite games of all time. Great review Pennsage. I just hope we'll get a console release of the Fate Extra games fully remade and localized. This is quite possibly the best mobile game out there Moo.